Will Glenn Beck’s Dwindled Fanbase Convert to His New Online Channel? Oh, Glenn Beck. I forgot about that guy. The frog-boiling, America’s Virginity Restoring (thanks, Gawker!) conservative snake oil salesman saw his Fox News fortunes rapidly reverse after his platform and position were roundly and effectively mocked into obscurity by Jon Stewart and Stephen Colbert’s “Rally to Restore Sanity and/or Fear,” a direct parody of Beck’s smaller rally a few months earlier. Beck soon left the station after his ratings dropped like a rock, left to preach to his base mainly on the platform of talk radio. Howard Stern went from ubiquity to relative obscurity in 2005 when he left terrestrial radio for the subscription satellite kind. Oprah Winfrey is struggling to retain viewers after ending her ABC talk show and launching her OWN cable network. And former MSNBC host Keith Olbermann is having similar difficulties at independent broadcaster CurrentTV. Along with the inevitable audience dropoffs, all three have found themselves struggling to inject their personalities into the culture and conversation the way they did when media conglomerates were blasting their messages out into the world. The point is an excellent one- Stern, Winfrey and to a degree, Olbermann were far less controversial and had arguably a more broad appeal to viewers. And at the risk of stereotyping, Beck’s audience is likely to be a bit less well-off, savvy or otherwise positioned to accept a higher-tech Beck show than those of the previous three. 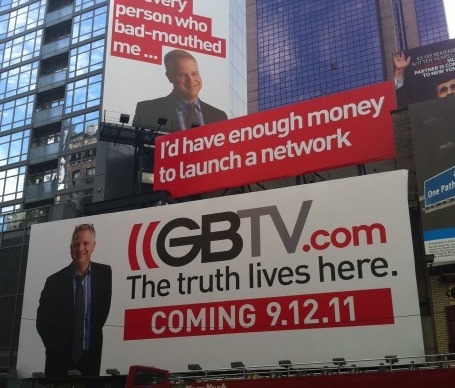 “The Glenn Beck Show” launches on GBTV.com next week- and it’s probably no coincidence that the launch date is September 12th. Access will cost $4.95 per month for a basic content package, and $9.95 per month for an enhanced content offering.